White and Ricky Skaggs came together for their maiden voyage as a touring trio, they weren't sure how it would be received. Now, more than 30 live concerts later, and with critics raving coast-to-coast, it's apparent that Cooder-White-Skaggs is a touring force to be reckoned with. The New York Times says Cooder-White-Skaggs is a "Roots-music celebration" that conveys "a sense of rare joyous occasion" while The Oakland Press calls it "a dream collaboration of kindred spirits." "The seven-piece ensemble delivered almost two hours of classic American roots music sung in glorious harmony, and the performance was at once virtuosic and disarmingly casual," wrote The Times Union newspaper following a performance in Albany, New York. Following the trio's Berklee show, The Boston Globe reported, "It was a down-home salute to country and bluegrass pioneers whose songs remain an indelible part of the canon, from Hank Williams ('Mansion on the Hill') and Jimmy Martin ('Hold Whatcha Got') to Flatt & Scruggs ('Gone Home') and the Delmore Brothers (an especially stealth 'Pan American Boogie')." The Philadelphia Inquirer says Cooder-White-Skaggs is "a comfort and joy, focusing on rural, family-harmony-driven, 20th-century classics." The Dallas Morning News raves, "Rarely has passion and performance been so effortlessly entwined in the context of songs written (mostly) before any of the players were even born." Due to the rising demand for Cooder-White-Skaggs, the trio will keep the train rolling into 2016 with the"Songs For The Good People" tour. Additional live concert dates have been announced in Atlanta, Nashville, Ft. Lauderdale, Tampa, Canada and more. See below for a complete listing of shows. 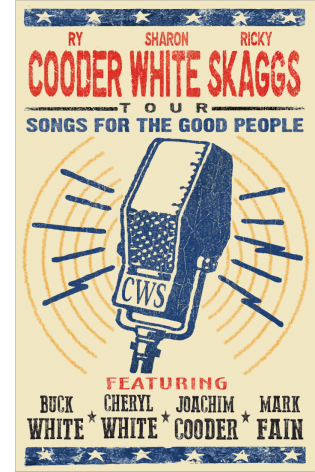 Cooder-White-Skaggs brings master multi-instrumentalists Ry Cooder and Ricky Skaggs alive on stage to deliver a revelatory program of blues gospel and bluegrass. They are joined by Sharon White, one of the purest voices in country music, Joachim Cooder on drums and Mark Fain on bass with occasional guest performances by Buck White and Cheryl White of The Whites. For more information on Ry Cooder, visit www.nonesuch.com/artists/ry-cooder. For more information on Sharon White, visit www.skaggsfamilyrecords.com. 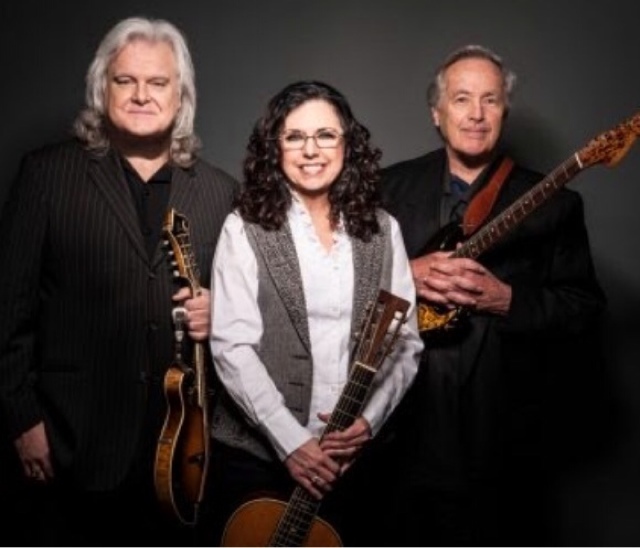 Over the course of his 40 plus year career, Ricky Skaggs has won 14 GRAMMY Awards, 8 CMA Awards, 9 ACM Awards, 11 IBMA (International Bluegrass Music Assn.) Awards, 9 ICM Awards, 2 Dove Awards, 3 honorary Doctorate degrees and countless other awards. Ricky has had 12 #1 singles on the Billboard Country charts and 12 Top 20 Country albums, along with twelve consecutive GRAMMY-nominated albums, all from his own Skaggs Family Records label. In 2012, Ricky Skaggs was inducted into the GMA’s Gospel Music Hall of Fame. Past recipients of this prestigious award include Elvis Presley and Dolly Parton. That same year, Ricky received the Cliffie Stone Pioneer Award from the Academy of Country Music (ACM). In 2013, Grand Ole Opry member Ricky Skaggs released his first-ever autobiography, "Kentucky Traveler: My Life In Music." The book details the life and times of Skaggs and provides a descriptive history of Country and Bluegrass music, as told by the master himself. Last September, Ricky received the Lifetime Achievement Award from the Americana Music Association in the Instrumentalist category.